This benthic goblin is not only spooky but deadly. The top pectoral fins have venomous toxins that can take a man down with ease. 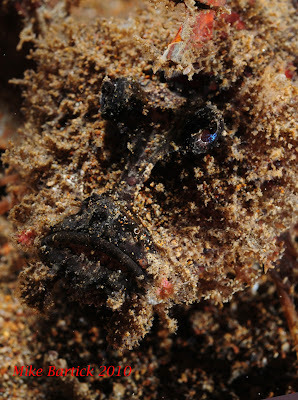 Benthic by nature and cryptic to boot, when surprised the spiny devil will flare its pectoral fins and display its Aposmatic coloration's. The first two spines on the lateral pectoral fins are disjointed and used to walk across the bottom giving the devilfish another name, The Pacific Walker. The challenge with shooting a sandy colored animal when it lives on the sand is trying to make it POP.Often times i will try using odd angles, this is a great example of a somewhat common animal that i have tried to present in a different way.